How an MFL teacher feels at the end of term? Reading Clare Seccombe's excellent blogpost on the benefits of Twitter really make me think tonight. Reflecting on what has come out of opening a Twitter account and getting involved (to an extent) with the MFL Twitterati has changed my approach to MFL teaching in so many ways. However, it has not always been easy to pass these changes on to my departmental colleagues. As teachers we have very busy lives; I am sure I am far from the only MFL teacher who also organises/goes on trips, runs a sports team, teaches extra-curricular lessons, organises MFL drama evenings etc etc. Just recently I have been prompted to reflect on these efforts; the half term break has provided a period of rest and reflection. These are just initial thoughts, and I would be interested to hear how fellow MFLers have embedded new technologies into their Schemes of Works and practices. Are you the only teacher in your Department who can "do it"? Or does your Department have a policy on the use of Web 2.0 which everyone follows and uses? What are the challenges of introducing these changes to other staff? gotta let something else go..."
Joe Dale's recent post featuring Russell Stannard's use of screencasting for student feedback , and Matt Lingard's blog were a great source of ideas for a recent show-and-tell ICT coordinators' meeting at my school. I chose to showcase screen capture tools, such as the mighty Jing - of which I am a rather large fan - and some others such as ScreenToaster, ScreenJelly and ScreenR . There is just so much that can be done with them! The Prezi below features 5 mini-tutorial videos, including a quick overview of what screen capture tools do. Big thanks to Russell, Matt and Joe for their great ideas! I gave a CPD session on using Web 2.0 to the staff at my school last night - my first one ever! It was great to be able to pass on information about the many inspirational and useful web apps that are out there for teachers to use, but I was struck by the fact that almost no-one attending the session had ever heard of any of the "funky" tools we looked at. Perhaps inevitably, I was asked, "how do you know all this?" The answer, of course, is that someone told me! The might of Twitter in this regard really cannot be underestimated. Everything I know (and I am WAY behind some people!) I have picked up from my colleagues on Twitter - The MFL Twitterati as they are otherwise known. I am convinced that the positive, open attitude of the teachers I have met online can be a huge force in changing teaching for the better. Who wants to be the pinch-faced teacher who never lets anyone copy his worksheets? Twitter to me is the antithesis of this. I started my session yesterday by showing them the marvellous Wallwisher that online colleagues created for our CPD session. Requests for this kind of thing come in all the time on Twitter, so I thought it might be old hat and get ignored. Not a bit of it. 20 replies in 2 days including videos, pics and some inspirational words from as far away as New York. I was feeling tired after two school trips over Easter, but that response has re-energised me and reminded me why I love the web! So thanks to all for your contributions, and keep on fighting the good fight! View more documents from simonhowells. 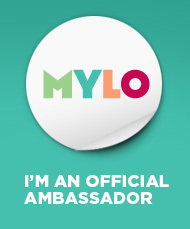 "Ambassadors are a point of contact for local MFL teachers, giving advice on the use of MYLO and reflecting on the experiences of others thus disseminating good practice." MYLO's open-ended "challenges" look like great fun and, importantly, tackle the "why learn languages" question directly with aspirational tasks - designing a menu for a top Montréal chef, for example. I particularly like the integration of social networking functions into MYLO - students will be able to look at work by their classmates and by pupils from across other schools, giving an opportunity for collaborative work and peer assessment. You will also be able to keep your pupils' work private if you so wish. Excitingly, students will not only be able to write on the site, but some challenges will allow them to record their own voice onto it. MYLO quite rightly encourages "learning to learn" - the videos we saw on language learning techniques looked great. I love anything that demystifies the language learning process for pupils! Whilst MYLO is currently a work in progress, the openness of the project (for example, all materials will be downloadable) and its flexibility bode very well. There is a very thorough consultation and feedback process in place, so MYLO should meet teachers' needs very well. Watch this space, and have a look on the MYLO website for a sneak preview! With Spring term in its hectic full effect it has been hard to find the time to blog. But I wanted to quickly share my recent experiences using the rather brilliant Quizlet. For those who have not come across it yet, it is a serious time saver and a great way for your students to revise vocabulary. Very simply, you enter words and their translations, and Quizlet comes up with slideshows, games and tests to help you practise and learn them. It has obviously already been embraced by a good number of MFL professionals, as a lot of content has been added already which might save you a job! The site has a real 2.0 feel to it - students can sign in to it using their Facebook accounts, comment on quizzes and so on. I have steered clear of these options to be on the safe side at school, but pupils definitely feel at home with the format. Quizlet seems to be developing a quickly and has been very popular with my students - they like the competitive element to some of the games too... so get on there and give your pupils a go at it! Being snowed in today gives a opportunity to reflect on an amazing half term. Before October I thought Twitter was a place for Stephen Fry to fall ever deeper into self analysis, or for Britney's agent to send out anodyne press releases. Now I know different! I would go so far as to say that Twitter has revolutionised the way I think about my job. It has rekindled my enthusiasm, and I have seen the results in the classroom. I have discovered an amazing community of enthusiastic teachers willing to share their excellence. There are so many brilliant teachers out there, some of whom can be found on the blogroll to the right of this page. We all know the truism that in teaching, you get what you give. Rarely has this been more clear to me. The response from students to the new things have tried with them over the past half term has been amazing, and not just because they have had fun. Technology used effectively takes them to another level. I can't think of a better way to develop the creative writing needed for iGCSE than using Storybird, for example. The FLIP camera brought a new urgency and focus to German Restaurant roleplays (I hope to post on this in the new year). Wordle got my sixth formers thinking about register and vocabulary. Wallwisher captured the imagination of my digital natives in Year 7 - mind you, so did the Bing Bong Song! A thoroughly-planned Google Maps project helped turn things around with my Year 10s. So, in the spirit of collaboration, where should I go from here? What tools should I look to use next? I have been thinking of trialling Edmodo in the summer, for example. Our school's Moodle site is slowly gathering momentum , so there is much to look at there. I will certainly be looking to consolidate the work done last term and to continue to use web based tools and technology with a clear purpose. I would be delighted to hear your thoughts and suggestions! On occasion critics of the use of ICT in MFL teaching can argue that the time taken to explain activities halts pupils' progress. On the contrary, I have found that using Storybird among other tools brings language alive for pupils and pushes them way beyond the limits of the scheme of work. Check out this effort by one of my pupils in Year 7.... she emailed it to me today - the first of the Christmas holidays! View more presentations from simonhowells. I have been using Storybird a bit this week as a nice end of term reward activity. However, the potential for "controversy" around students having to sign up for websites meant that my gut instinct was to steer clear of this. Instead, as the images have been left open to copy, I had students paste them into Powerpoint and play from there. It is amazing what can be done in a 35-minute lesson! Students were clearly enthused and motivated thanks to the quality, and in some cases the cuteness of the artwork! The response from students to work such as this has been overwhelmingly positive. Luke O in my Year 10 set 3 produced this story - I asked his set to produce something a Year 7 pupil would understand. Some class members produced very long stories in one lesson, but I like the cartoonish humour of this.